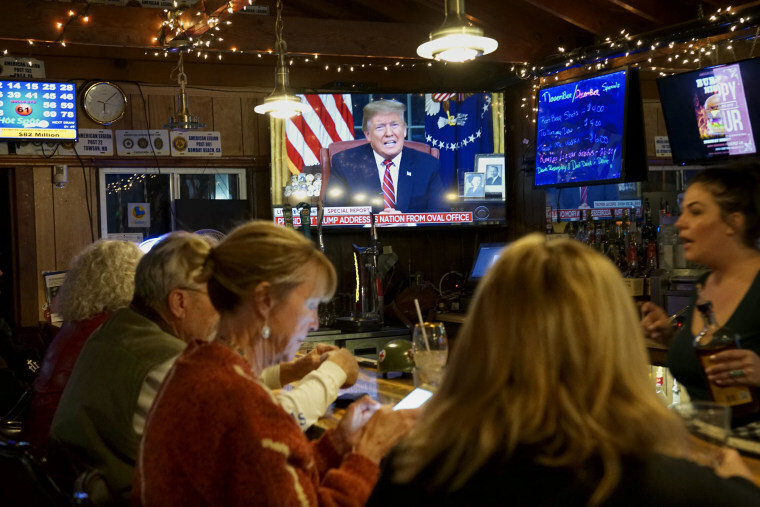 On Fox News, viewers tuned out after Trump's speech, while on CNN and MSNBC, more tuned in for the Democratic response. President Donald Trump’s national address on immigration drew millions of Americans to their TV sets on Tuesday night — and highlighted a partisan divide among the cable news channels. Fox News won the biggest audience overall, drawing 8.2 million viewers for the president’s speech from 9 p.m. ET to 9:15 p.m. ET, according to data from the media analytics firm Nielsen. That number dipped to 7.9 million viewers for the subsequent 15 minutes, in which House Speaker Nancy Pelosi, D-Calif., and Senate Minority Leader Chuck Schumer, D-N.Y., delivered a rebuttal to the president. The trend was reversed on MSNBC and CNN. MSNBC reported that it drew 4 million viewers for the address, but that number rose to 4.5 million for the Democratic response. Similarly, CNN attracted 3.4 million viewers for Trump's portion and 3.7 million for the response. Nielsen provides viewer data to its industry clients. Sources in the media industry passed the data to NBC News but asked not to be named, citing the sensitivity of the data. Among the networks, CBS drew the most viewers for its coverage of the address, earning 8.1 million viewers thanks to a strong lead-in from its crime procedural “NCIS.” NBC came second, drawing 7.4 million viewers for its broadcast, and ABC attracted 5.4 million viewers. NBC topped its network rivals in the advertiser-important category of 25-54 year olds, which are most sought-after by advertisers, attracting 2.75 million viewers, compared to 1.79 million viewers for ABC and 1.7 million viewers for CBS. Nielsen measured viewing for each network’s broadcast, and some networks opted to extend programming a few minutes longer than others. NBC’s broadcast ended at 9:25 p.m. ET, while CBS went back to regular programming at 9:30 p.m. ET. ABC ended its broadcast at 9:20 p.m. ET, as did Fox. Apex Marketing, a firm that tracks and analyzes TV airtime, said that the estimated media value of the Trump speech was $17.7 million.